Now if I could only figure out what to do about my horrible looking bumpers! Heat gun broski. You can make them look pretty good. My guess is cutting boards on the flaps. Recent pictures from our first snow. I took my yakirack off since it drops me about 2mpg and I really don't use it too often. I'm saving up for an LM7 or L33 and T56 along with a Ford 8.8 since I would blow up the Dana 30 in a hour. Reasons for the LM are its cheaper and unbeatable for my needs. Rather have the noise of a 1JZ though. I want some snow, too! A Volvo 240 does not have a slow zero to sixty time. Nor a fast one. It reaches sixty precisely when it means to. Did you fix your real coil-popping-loose problem? I cut some tow strap, folded it over to thicken it, looped it through the coil and seat, then put two bolts holding it together with washers and lock nuts. I gave it enough slack for the coil to fully unwind with the strap holding it in at limit.so far so good. Never did anything else to them, I just stopped jumping the car instead. I still plan to strap them, it's just low on the list right now. I approve of this car. 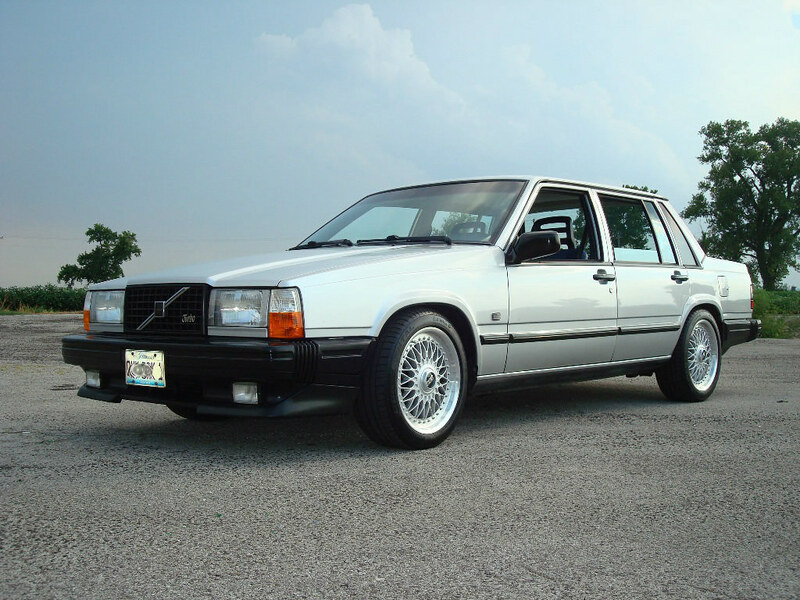 1989 Volvo 744T- 16v turbo, '94 FD-block, RSI pistons/rods, GT35R, Tial 38mm, RFL, MSnS-E, DSM spark, 100lb Delphis, 4.6 springs, Bondo header, Heebspeed intake, Q45 90mm TB, Bosch 044 FP, 12x24x3 ebayIC, w/c t5, Clutchnet 4puck/PP, 4.10 G80, IPD sways, 960 brakes. 1983 Ford F150- '89 5.0 H.O, C6/4x4, F+R LSD 4.10, 7" lift, 35s. 1990 Cobia San Marino 225 ECS- MCM 350 Mag, GM Bowtie Intake, HR-Titan 19p. I love hooning around in this car. It rides nice and gets even better looks. When Josh gets a LM7 put into it, it will be the most nonsensical car ever. edit: it needs 3-4 times the power, only complaint, it's slow as balls. Slower than a n/a 240. Mine is still going strong... sort of... Had a blown headgasket for some years that gave up totally now so put a lightly ported 531 top with a VX3 cam on. Now I need a bigger turbo which can cope with the higher revs it makes, and then I probably need a stronger clutch too. Cutting boards may be? I bought 4 green ones myself from IKEA which I'm going to put on some day, ripped my left front mud flap off when reversing out in the terrain and it got stuck between the wheel and a rock. Here is my 1989 745 on 205/75R15 Grabber AT2's. Had to bang the strut perch up (rubbed) but plan on cutting/welding it up higher and lifting the rear up. I'd say this is the largest tire you can go without doing virtually any modifications to the front strut perches (aside from a little bit of time with a 8lb sledge). Tire diameter is 27.4". If you can weld I would say lengthening the struts like I and Rectilinear did is easiest and the best way for keeping the performance and don't top out the shocks so easy using the same springs. Then simply put two hockey pucks as spacers on top of the rear springs. 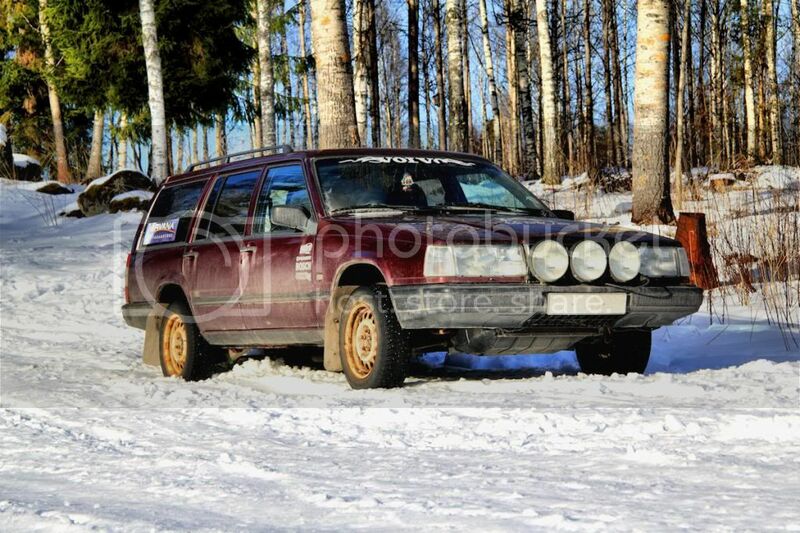 Hey guys, still haven't made much headway on getting my hands on a v70XC. I REALLLLLLY want to lift a v70r AWD. That would make people howl! BUT, I have been toying with the idea of testing out some of my suspension ideas on my 96 850t. I'm still gonna go with the XC90 struts and jeep springs on the front, I just don't really know what to do about the rear? I'm fairly sure that the mounting of Procomp style shock won't work on the p80 platform. One interesting thing I've seen is that mounting brackets from the rear shocks on Subaru Foresters and Outbacks look very similar. Not only that, they make some delrin body spacers that look like they may fit as well! Why don't you make your own thread? Looks good with the white omegas. If you don't want to bother painting the bumpers, there's a black dye called Forever Black that works great and lasts really well. Why should I make my own thread? We're all here talking about lifting Volvos...and these guys have lots of experience with it. Anyone else have a problem with that? Maybe you're just trying to live up to your user name. Hey man, just get to work on it. Everyone is sweating each other lately. I think that because of the nature of the rear suspension on your car, we are unlikely to have much experience to share with you to get it lifted. I think no matter what, you will end up with tons of positive camber in the rear, but I may be wrong. Jump in and experiment with it and post it here if you don't want to start your own thread about it. I jumped in and basically hijacked this thread when I lifted my wagon so no worries. You are venturing where very few would care to venture, but I for one am very curious about how you execute it and how you like the results. Therefore, take lots of pics!! Maybe you're just trying to live up to your user name. Maybe you're reading to far into it? You've got some cool stuff you're trying to do. Make your own thread so we can see. I picked up an LM7 today. Its going to get incredibly real. Nice! Are you starting a new thread for that? If so, let me know! In the meantime, my wagon just pulled a Ford truck out of an icy ditch on my way home from work. Love this damn car. Should of taken a pic and plastered all over the internetz. No kidding, about a month ago, I pulled a 2500hd that ran out of gas. If I find a white Dodge extended cab to tow, I can complete my Big 3 rescue trifecta. i need one of these for a DD. This is officially the second large drill bit my car has collected since last year. The first one was an 18" masonry bit that wedged itself under the car right next to my fuel tank. I just don't understand why they are attracted to this car! Wow, this thread is awesome. These 945 Cherokees look like a lot of fun. It's uncanny how much they actually look like bizarro Jeeps when lifted on A/T tires. Original ZJ generation Grand Cherokee, perhaps, but out of proportion. so how is the mileage on these wheels ?